This route passes through one of the more remote areas of north-western Damaraland, an awesome wilderness where indiscriminate off-road driving unfortunately also left its mark on the sensitive plains. It is an extremely difficult route and should only be undertaken by experienced 4×4 drivers, preferably in the company of other experienced drivers. It is always advisable to travel in a group with at least two vehicles in case of a breakdown. This route can only be negotiated with the help of GPS coordinates, available form the Tourist Bureau, or in the presence of a knowledgeable tour guide. 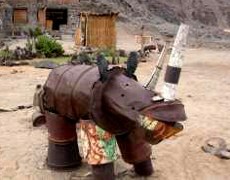 The route starts at the so-called Rhino Camp in the Ugab River, run by the Safe the Rhino Trust in conjunction with the local community to ensure the future of the desert rhino in the area. From here the route takes you to the Gai-As spring where stone circles provide evidence of an early Damara settlement. 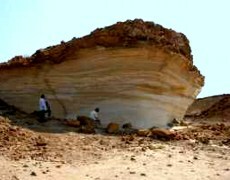 The higher structures (near the waterhole) with the hollow wall can be of European origin. There are many interesting rock formations in the area, like this mushroom-shaped rock. 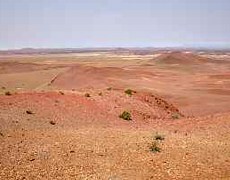 The route turns north-east through the Doros Crater, the Burnt Mountain, and the Organ Pipes to Twyfelfontein and the Aba-Huab Campsite. There are various detours to take you to other sites of interest. This route will take you at least 3 days to complete. Although you can camp anywhere the unwritten rule is that no camping is allowed within 2 km from any open water. Unfortunately many people do not realize this and still camp directly at waterholes, which is very disturbing to wildlife. A rock containing pyrophyllite in the Amis Schlucht on the western slopes of the Brandberg Complex is occasionally quarried. The attractive rock (“Brandberg Pyrophyllite”) is used as a carving stone. Production is very irregular. In the Goboboseb Mountains individual crystals of amethystine quarts and blooms of pale green prehnite occur in the basalts.